Slate is a rock that is formed through pressed mud. This makes the stone tough, durable and easy to split into layers, which makes it easy to turn into tiles. Slate can either be left in its natural- cleft state, polished, or honed. Slate is durable enough to be used as flooring, in showers, as countertops, and more. It is important to properly care for your slate to keep it in beautiful condition. Slate is a natural stone, so like many natural stones, it can present a sensitivity to some acids and alkaline cleaners. These cleaners have the potential to etch the surface of the stone leaving it’s scarred. This is especially true for honed and polished slate flooring. It is important to sweep the slate regularly, this removes the surface dirt. To properly care for your slate, you must wash the slate with a stone cleaner regularly. Be sure to avoid acidic cleaners, such as lemon or vinegar. 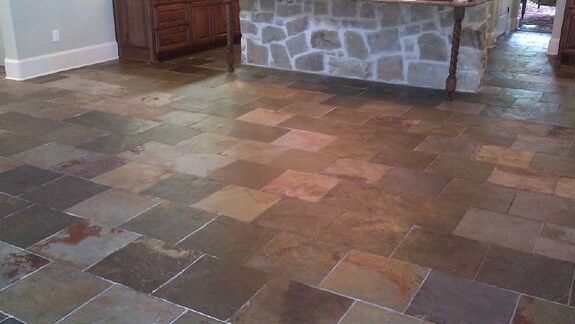 There are all types of slate that are used as flooring throughout Houston. Some of this slate flooring is made from slate tiles. Quartzites are stones that are sometimes used in the creation of these slate tiles. Most types of slate are porous, which make them susceptible to absorbing moisture, which means they are also vulnerable to staining as well. Since slate is vulnerable to moisture and stains, you should have your slate sealed at least once a year to prevent damage to the smooth appearance. If you are unsure if your slate floors need to be sealed, you can conduct a small experiment with water. Pour about half a cup of water onto your slate floors, wait ten to fifteen minutes and then wipe it away. If the place where the water was is darker, this means your slate’s surface is porous and unprotected. This is an indication that you need to seal your floors before more damage can affect the stone. If the slate does not change color this means the seal is still strong, for now, leaving you time left between seals.